The Center for Cultural Diplomacy Studies (CCDS) is the world's leading institute for the study of Cultural Diplomacy. Four different categories of education programs on Cultural Diplomacy are offered: graduate degree programs, e-learning courses, professional development programs (certificate programs) and study abroad (credit programs) dedicated either fully or in part to the field of Cultural Diplomacy. Our objectives are to extend current research, programs and practices in the field of Cultural Diplomacy and create a platform to promote and sustain inter-cultural dialogue at all levels. The CCDS is committed to the promotion and development of applied cultural diplomacy studies, as well as excellence in the advancement and research in this rapidly evolving field. The Center for Cultural Diplomacy Studies offers educational and academic programs in partnership with leading universities, enabling students to explore, analyze and experience cultural diplomacy both in theory and in practice. The CCDS focuses in particular on exploring the balancing between hard and soft power, global governance, the process of globalization in an interdependent world, international economics & business, multiculturalism, intercultural dialogue & exchange, human rights, and religion. As a whole, we research the ability for culturally based initiatives to further mutual understanding and in turn to foster global peace and stability. The programs offer high levels of leadership and provide students with the skills to shape their future leadership roles while addressing critical issues challenging the world today. 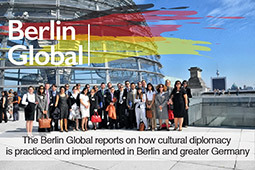 The programs provide advanced knowledge and analytical tools for the study and practice of cultural diplomacy and address the potential that it has in shaping international policies and global strategies.